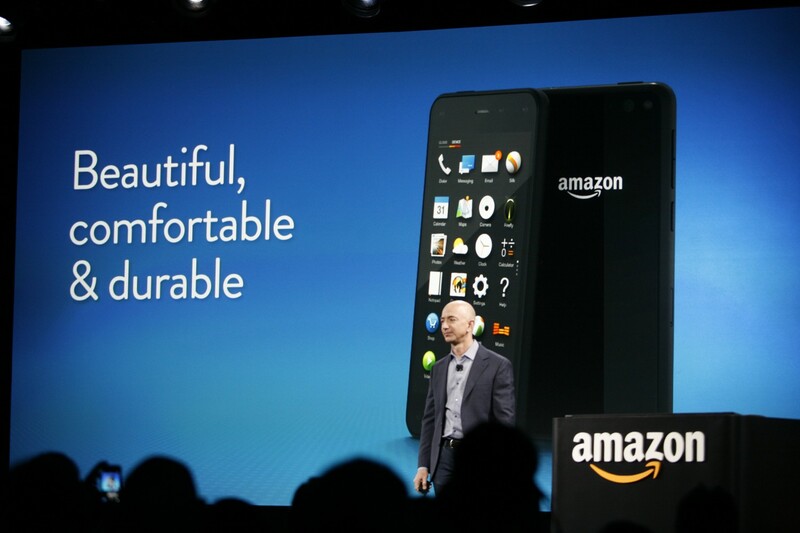 In a move that will surprise absolutely no-one, Amazon today unveiled its first smartphone. 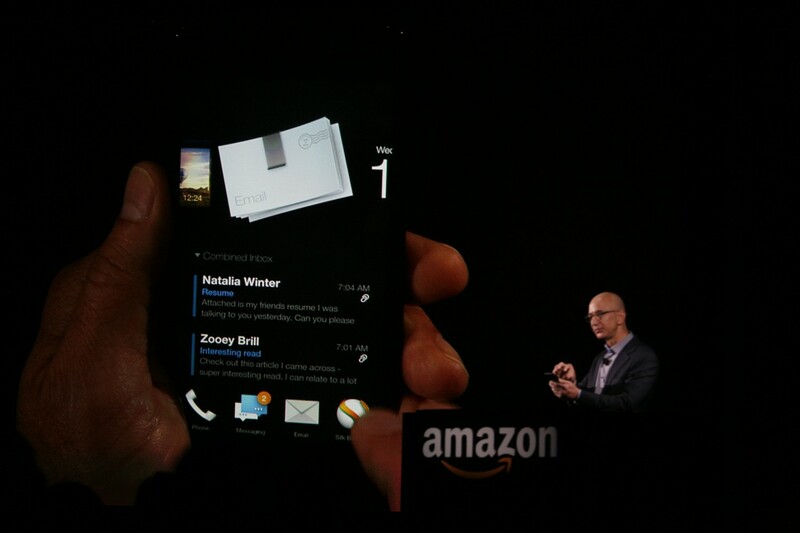 The device is exclusive to AT&T and will set you back $199 (32GB) or $299 (64GB) on a two-year contract. On its site, the company is also listing the device for $649 (32GB) and $749 (64GB) without a service plan. Pre-orders start today and it’ll launch on July 25. The device has a 4.7-inch IPS LCD HD display, built with Gorilla Glass 3. The screen offers 590 nits of brightness and sports a circular polarizer to improve outdoor visibility. The smartphone itself is black and surrounded by a rubberized frame. Similar to the Nexus 4, the device also has a glass panel on the back – if you’re accident-prone, you might want to look elsewhere. The Fire Phone supports 4G LTE and runs on a quad-core 2.2 GHz processor, as well as an Adreno 330 graphics processor and 2GB of RAM. Shutterbugs will have a 13-megapixel rear-facing camera to experiment with – it comes with Optical Image Stabilization (IOS) and an f/2.0 five-element lens. There’s also a dedicated camera shutter button that launches the Fire Phone’s camera app, which could prove useful for ‘spur-of-the-moment’ type shots. To combat Google and its evolving Google+ photo-storage service, Amazon is also offering free, unlimited storage on Amazon Cloud Drive. For a limited time, Amazon will also pack in a year of free Prime membership. 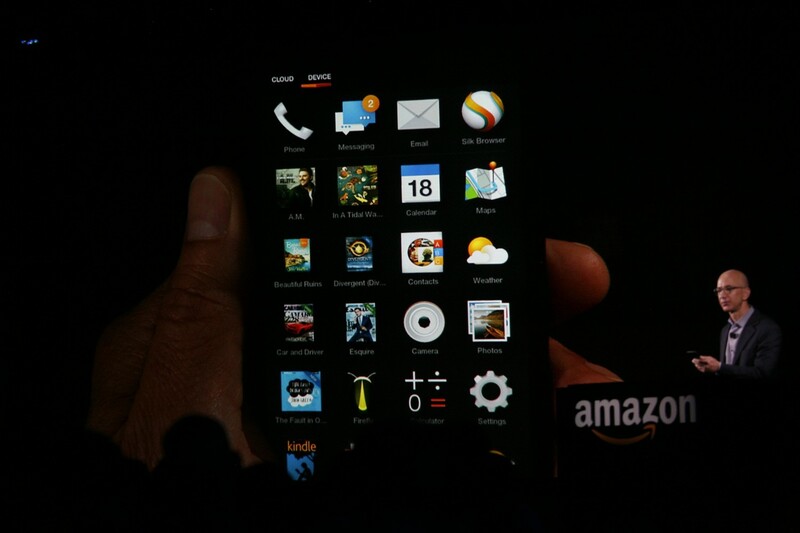 On the audio side, the Fire Phone boasts dual-stereo speakers with Dolby Digital plus. 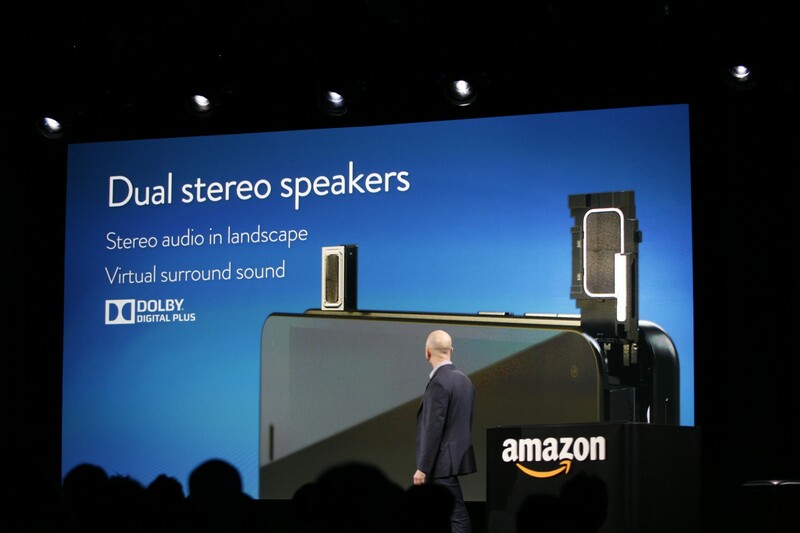 Amazon says it offers stereo audio in landscape, as well as virtual surround sound. They’ll need to be something special to beat the excellent front-facing ‘BoomSound’ speakers that HTC ships with its Android smartphones. Apple is known for offering decent headphones with all of its products, including the iPhone. 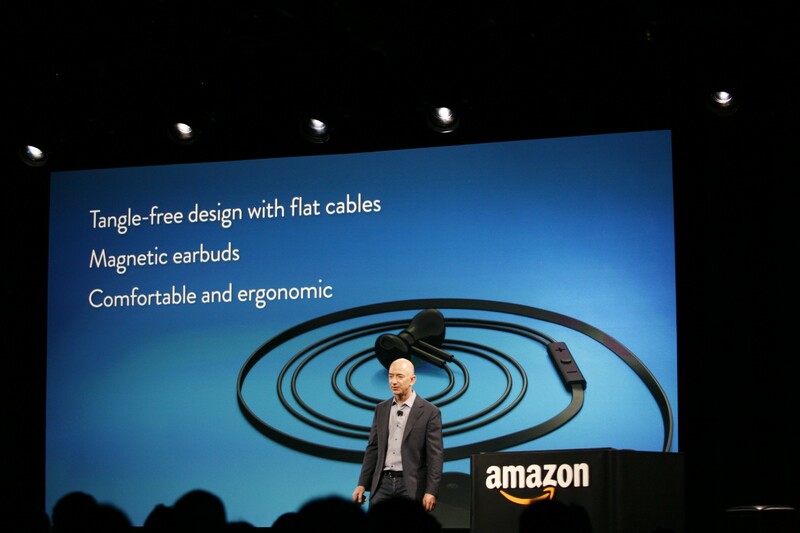 Amazon is taking the company head on with its own “tangle-free” design, which features flat cables and magnetic earbuds. Amazon describes them as “comfortable and ergonomic,” although we’ll reserve judgment until we’ve had some hands-on time. Like the device, they’re black and fairly unobtrusive. The slick earbuds also sport volume controls near the top of the cable, which is a nice touch. If you haven’t picked up a Google Chromecast yet, you might want to hold fire (pardon the pun). With the Fire Phone, you can send content across to your Fire TV and then grab extra details about the show or movie you’re watching using its X-Ray service. 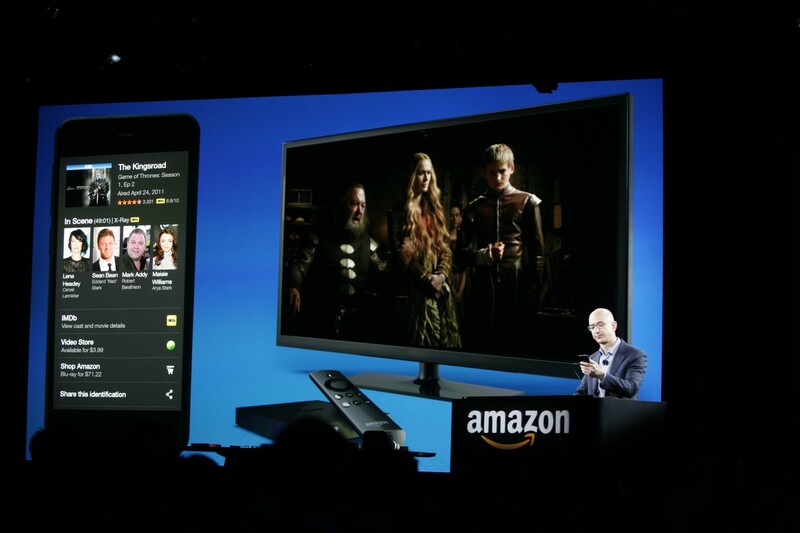 Amazon is also bolstering its first smartphone with ‘ASAP,’ which effectively predicts what you want to watch next and then pre-caches it in the background. If it works as promised, you should be able to watch content instantly – no buffering or annoying load times. 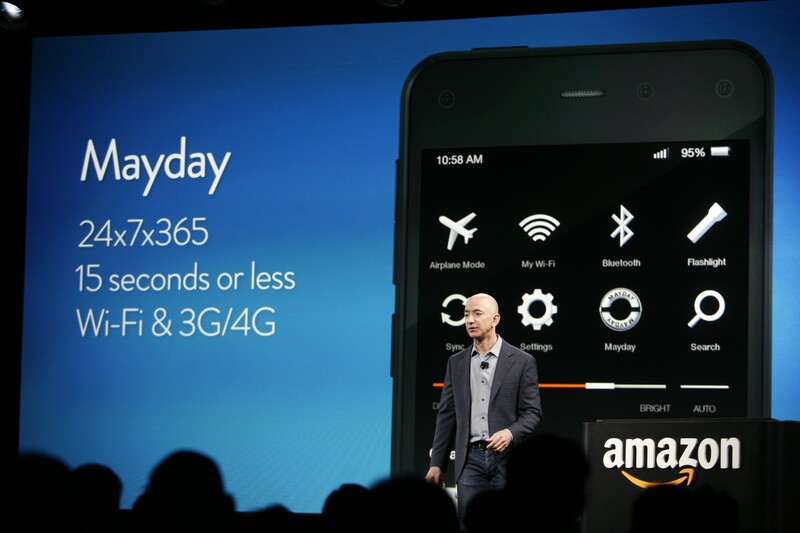 First introduced for its Kindle Fire tablets, Amazon is also bringing its Mayday customer service to the Fire Phone. 24 hours a day, 365 days a year, you’ll be able to summon a real person for some assistance with your handset. Amazon is promising response times of 15 seconds or less, and it should work flawlessly provided you’re on a 3G, 4G or Wi-Fi connection. Next, we have an entirely new software feature called Firefly. Using the smartphone rear-facing camera, it can be used to identify 100 million different items. That could be a number, a DVD, a QR code or a video game. It compensates for glare, wrinkles and curves, and will store all of your previous searches in a handy list. As you might expect, from here it’s then possible to purchase the object from Amazon, Audible and the Kindle Bookstore. Similar to Shazam, Firefly can also identify music. Wait for a moment and the Fire Phone will tell you the track name and artist, before giving you a shortcut for – yes, you guessed it – its product page on Amazon. The same also applies for TV shows, so if you’re watching an episode of Game of Thrones – it’ll be able to identify that too based on the audio alone. Underneath the volume rocker, you’ll also find a dedicated Firefly button. Clearly, this is a feature Amazon wants to push as one of the Fire Phone’s defining features, similar to what Google, Microsoft and Apple already do for Google Now, Cortana and Siri respectively. There’s also a Firefly SDK, allowing third-party developers to fully integrate their services – in one example, CEO Jeff Bezos took a picture of a painting and was instantly greeted with its relevant Wikipedia entry. Amazon also mentioned using Firefly to scan foods you eat into the MyFitnessPal app, or using Vivino to scan a wine label and learn what it tastes like. As expected, the Fire Phone also offers some 3D trickery. In short, the display elements move as you tilt the phone from side-to-side. This can give the impression of depth to a 3D-rendered map, or quickly bring up a navigation drawer in the OS. This motion control can also be used to scroll through pages in the web browser, or through an ebook – Amazon will also allow you to lock the scroll speed so you can read without pawing the screen. To create this sensation, Amazon developed special cameras with a 120-degree field of view. For comparison, most front-facing smartphone cameras only offer a 72-degree field of view, which is usually fine for selfies and video calls. 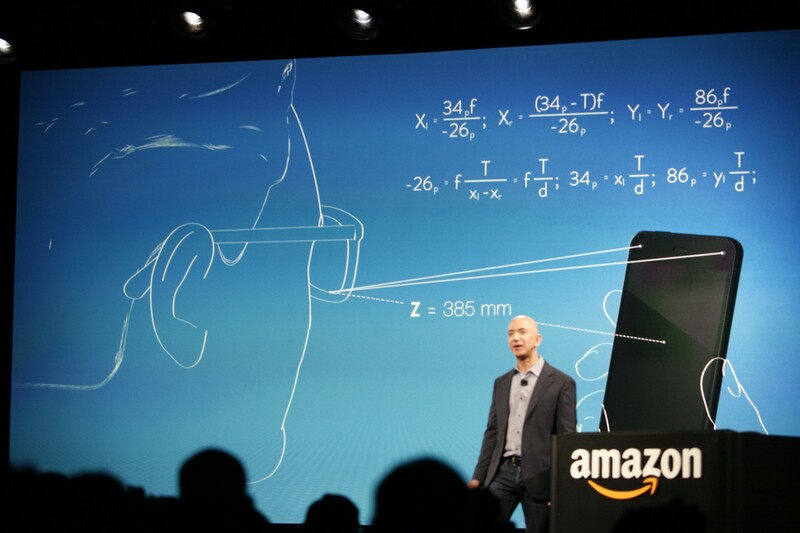 To understand how far your face is from the display, Amazon needed at least two cameras for the Fire Phone. The final number was bumped up to four, however, so that Amazon can quickly alternate between the best two at all times. For those moments when you’re in total darkness – say at the cinema, a concert, or when you’re watching a film in your living room – Amazon has also fitted each camera with an infrared light. With all of this technology combined, Amazon can accurately identify where your face is in relation to the smartphone. It might sound a little creepy, but it’s a similar approach to what Microsoft took with its Kinect peripheral for the Xbox 360 and Xbox One. 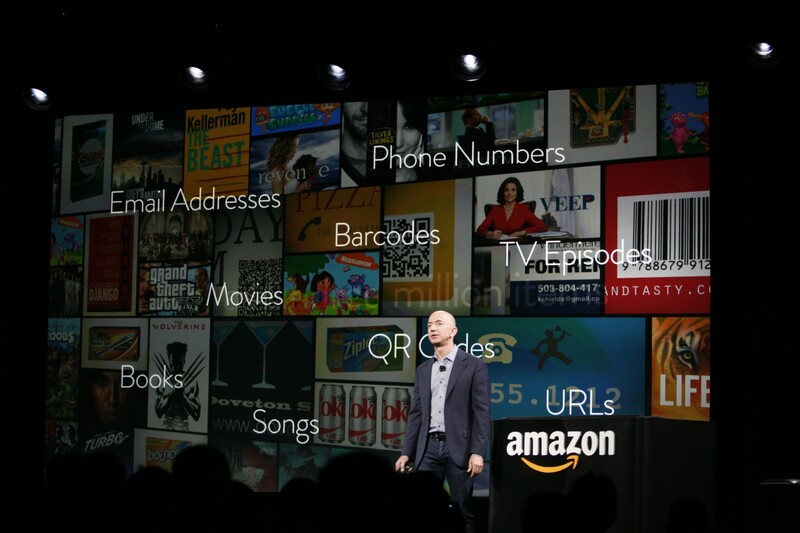 On the software side, the Fire Phone uses a fairly conventional grid of apps. While the iconography for its stock apps is completely new, the overall look and feel should be familiar. If you’ve used Fire OS in any of its Kindle Fire tablets, you’ll have a good idea of the general aesthetic Amazon is shooting for here. On the home screen, you’ll find a horizontal carousel and a dock for four app icons underneath. You can swipe through the carousel to access frequently used apps and content, although similar to Android widgets, these will also support breakout information underneath. The calendar, for instance, can show your full schedule, while the camera app displays all the photos and videos you’ve shot recently. The space underneath the carousel is fairly limited – so don’t expect too much functionality here – but it might appeal to casual smartphone users. Two weeks ago, the firm teased its debut handset with a video on YouTube, which showed a bevy of customers praising one of its mystery features. Held just out of shot, many presumed it was hinting at the Fire Phone’s rumored 3D effect. TechCrunch reported on the feature in October last year, suggesting it would use front-facing cameras to create a sense of depth. The relentless stream of leaks and rumors – the first reports emerged way back in July 2012 – arguably softened the impact of today’s announcement. Between BGR’s leaked photos and the Wall Street Journal’s report regarding AT&T exclusivity in the US, we already knew a lot about the Fire Phone. There were some surprises though – Firefly being the most notable – and the sheer range of bundled services, including X-Ray, MayDay and unlimited cloud photo storage – were all unique and quite impressive. Amazon is entering a fiercely competitive space, however, currently dominated by Apple and Samsung. The company’s focus around services could be a key differentiator though – if Amazon can use the device to promote Prime and its e-commerce site, it can justify lowering the Fire Phone’s price later on. Arguably, $199 (32GB) and $299 (64GB) is already quite a deal – but like its $99 Fire TV, some had hoped Amazon would go for an even lower price point to truly make an impact in the US. Time will tell if it’s done enough.